We’re happy to inform that a demo is available for “Stellar Sphere“, and can be downloaded right now, for those who want to try the game to feel its taste. This demo allows you to play the first ten levels (from Alpha to Lambda) of the “Stellar Short” scenario. All elements are active in the game. This includes the configuration menus, which allow you to modify all the gameplay parameters. The only thing that has been cut is the maximum time per level, which in the demo is 5 minutes. More than enough time to test in the ten levels the characteristics of the game. The demo will be updated. Unlike other demos, which remain forever as they were published, the demo of Stellar Sphere will also incorporate new elements that affect the demo and we’ll upload those new features. Therefore, every time the player plays with the demo, he/she will be doing it with an equal version in everything to the final version. Version 1.1: “The Wrath of gods”. The second feature, which is incorporated in version 1.1, is what we call “The wrath of the gods”. 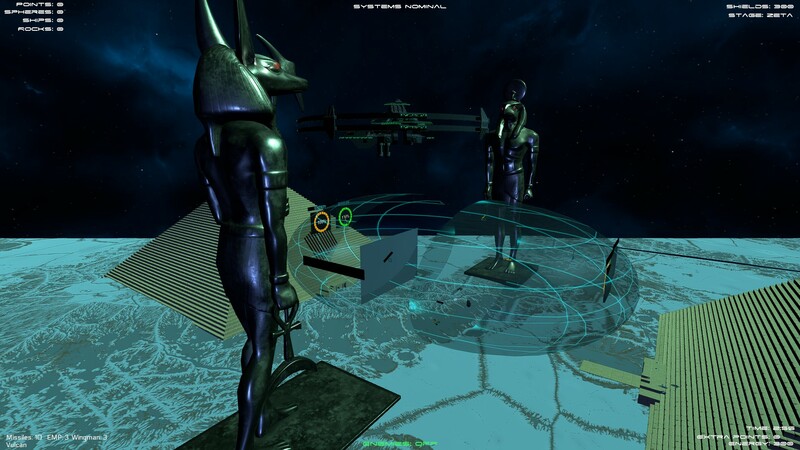 The Egyptian scenario, with Horus and Anubis, and the Greek scenario, with Zeus, will see how the gods can choose to help the player, or finish him off. And remember the gods are capricious. The format of these two scenarios works as follows: all elements of the other scenarios act alike. But in each of these scenarios there are two statues of two well-known gods from Egyptian and Greek mythology.The gods will value your way of playing, and how you act and compete for the highest score. If they think you’re doing well, they’ll support you by destroying enemy ships. By the way, Athena will bring new features and surprises in the future. Each time one of them acts, you’ll see a small window on one side of the screen, showing the god throwing a lightning bolt. This ray will have chosen a ship that is attacking you, and will destroy it. However, if you are sleeping and you don’t score enough, or destroy enough ships, the gods may get mad at you. Then they will attack you, rather than the enemy ships. And that will be a serious problem for your survival. What if, on occasion, it happens the other way around? Well, gods are capricious. If any of them decide to change their mind on some occasion, you must remember that they are gods, that is, totally unpredictable. Next time they may decide to make a mistake in your favor. Version 1.1 is now ready, and the gods will decide your destiny. And remember: in these scenarios they cannot be deactivated. A god never had a button to activate or deactivate it. Good luck with the championship. As usual, you can find more info on IndieDB. Thank you. We have a new article on IndieDB: “Tactical combat: the basis to score and survive“. Here we talk about different tactics to score the maximum points in Stellar Sphere while trying to survive. Meanwhile, 15 days to release the game, and the hard work continues. Thank you for your support! One of the configuration elements included in Stellar Sphere will be a slider with a “random events” value. When the player increases this slider, the possibility of different random events will be active and could happy at any time. 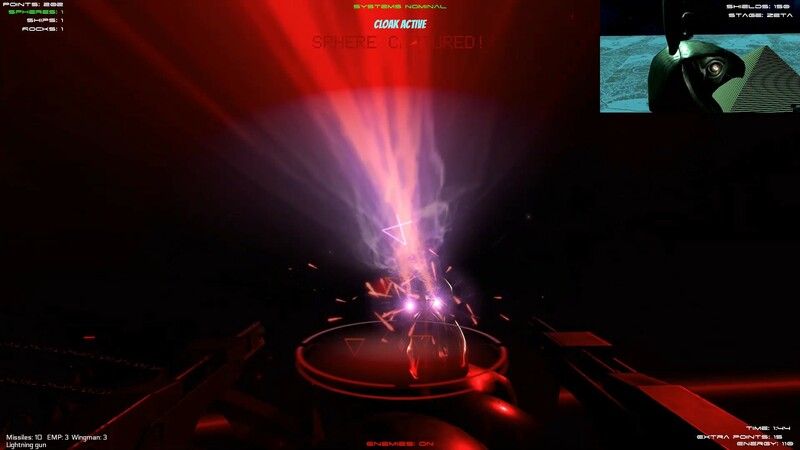 This events include asteroid storms, fire bars that collide with the player, night vision, thermal vision, and others. Some of them will be included on release, others will be included later. In this video some of these events occur while the player is trying to score. And survive. We’ll talk about this in detail. The work continues with Stellar Sphere, and now we have uploaded a new video, the third one: Physics in Stellar Sphere. In this video we talk about the physics of the game around three basic elements: the Stellar Sphere, the Starship, and the gravity. With this three elements combined, the player can choose how to configure the physics of the game in a way that can be adapted to any player. The elements we talk here are related to Newton laws, and imply how the sphere and the ship moves and how friction affects the movement, and also if the player wants to activate gravity when playing. Changing these parameters in the game using the config panels can dramatically modify the experience of the player. Sometimes easier, sometimes very hard. The way you play is up to you: we give you the tools. You play the way you like it. The important thing is: never forget Isaac Newton! You also have more info on IndieDB. Thank you, soon more info coming. One of the random elements that will be available in Stellar Sphere will be the Asteroid Storm. If random elements is active with a probability greater than zero, there will be a chance that an asteroid storm will rise in the game. Be careful then, destroy the asteroids, and avoid being destroyed by the collisions. More info on the Steam page. Also on the official page of Stellar Sphere. We are happy to inform that the first video of “Stellar Sphere” is ready, where the main features of the game are shown. We also are finishing the first videotutorial when we explain details of how to play the game. Nevertheless, remember the FAQ and manual are ready and they show the main features of the game. Thank you.